Lil' Bits "Woof" includes so many poignant journal cards, sentiments, digital stamps and word art images to allow you to say just how you feel! Sometimes it can be hard for some of us to put our feelings into words and we are here to help! 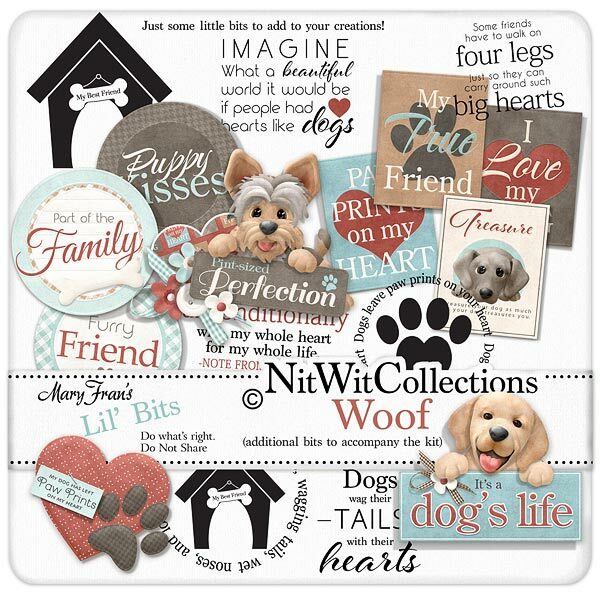 Don't miss out on these digital elements as they are not included in the FQB "Woof" Collection so don't pass these by! 1 Journal Card - "I Love my Dog"
1 Journal card - "Paw Prints on my Heart"
1 Journal card - "My True Friend"
1 Journal card - "Treasure....."
1 Label Circle - "Furry Friends"
1 Label Circle - "Puppy Kisses"
1 Label Circle - "Part of the Family"
1 Sentiment - "I will Love you unconditionally..."
1 Sentiment - "Dogs wag their tails with their hearts"
1 Sentiment - "Some friends have to walk on four legs...."
1 Sentiment - "Imagine what a beautiful world it would be if...."
1 Digital stamp - "Dogs leave paw prints on your heart"
1 Digital stamp - "This home is filled with kisses..."
1 Word art - "It's a Dog's Life"
1 Word art - "My Dog has...."
1 Word art - "Pint-sized Perfection"